I ordered three books for kids about adoption and they came in the mail today. So I read all three of them to the kids before bed. They were really cute books and Mason understands that not all kids have a mommy and daddy that can take care of them. He understands that while they may grow in one mommy's belly, that sometimes another mommy takes care of them. Me: See this baby girl? She doesn't have a mommy or daddy, or a brother and sister like you and Payton. Mason: Aww, she is so cute! Me: Yeah, she is pretty cute, huh? Me: Aww, that is so nice. Mason: Mommy, maybe I can be her brother and you can be her mommy and Daddy can be her daddy and Payton can be her sister and Zoe can be her dog. Me: Maybe! Do you think we should see if she wants to come live with us? Me: Well, what do you want her name to be? Mason: Ummm (long pause), how about Motorcycle? Me: (chuckling) Motorcycle, huh? That isn't a name, you silly! How about Addison? Mason: Oh, yeah yeah! (Pointing to the picture) This is Addison, like Madison at school. Addison and Madison. Me: Yeah, Addison and Madison. Madison, just like Maddy and Ella too ... Maddy's real name is Madison. Congratulations, I'm glad the news went over well. I am SO excited for you all!! well i like the name motorcycle!! haha. sounds like she is going to fit perfectly into your family. how wonderful bethany.. i am so excited for you guys! Hi! 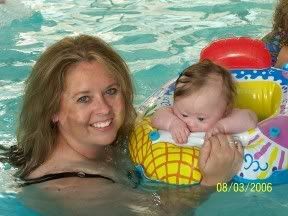 My name is Heather and my husband and I just had a baby girl with Downs. She is our third girl. Your blog has been encouraging to me as you are a little ahead in the game and we are just beginners. You can check our our blog at www.messickmom.blogspot.com. Writing about our experience with her has been therapeutic. We have realized through initial grief, that she is, indeed, a gift. Thanks for sharing your story so people like me can read about it and be encouraged. How wonderful! I hadn't clicked over here in a few days, and I've been missing great news! I am so thrilled for you all! So Awesome!! I am so glad that everything is going well with the adoption! Mason is such a sweetie! I love how he suggested her joining the family and him becoming her brother... what a loving boy!